Asia’s largest airline, China Southern Airlines, is entering the home stretch of an ambitious strategy to boost its international network and shift reliance away from its domestic market. The largest of China’s major carriers, China Southern sees its 2014 launch to Frankfurt and New York as capping off a network that has grown rapidly in Australia, as well as adding London. International RPKs comprised 20% of China Southern’s network in 2013 for the first time, up from 14% in 2010. International revenue has lagged, comprising 17% of 2013’s passenger revenue, up from 13% in 2010. This is not entirely a success story. Its A380s do not have enough markets to reach. Sustainability lags, and China Southern’s growth has often created over-capacity. China Southern expects 2014 system ASKs to increase 13%, higher than 2013’s 10.2% increase. A breakdown by region was not stated, although international capacity in Jan/Feb-2014 was up by over 20%. But management repeatedly emphasised at the carrier’s annual results that China Southern’s international strategy is nearing completion. Or at least is nearing completion in terms of capacity growth, which while exhausting is easier than the next phase of China Southern’s internationalisation: strategic growth through partnerships and a better understanding and relationship with markets. So while the message from the carrier about focus may be strategy over growth, capacity growth will continue in double digits. China Southern is Asia’s largest carrier and has China’s largest domestic network of the Big 3 – also including Air China and China Eastern – but has the smallest international network. Air China (mainline, excluding subsidiaries) has a domestic network smaller than China Southern’s but an international network that is larger. While China Southern has cited high-speed rail as a severe threat and reason to expand internationally, this has likely been over-stated. There is competition from high-speed rail, but not as much as the carrier has made out. High-speed rail was largely uncoordinated with aviation and so tensions remain. China Southern’s reminder of high-speed rail could have allowed it to curry favour with the government for its internationalisation. Further, China Southern has the backing of its Guangzhou hub, which has the long-term objective of being a transit hub; China Southern even branded its Australia-Europe services via Guangzhou as the “Canton Route”. China Southern has successfully met its target a year early by having 20% of capacity in the international market by 2015. International ASKs comprised 14.8% in 2010 and then 20.5% in 2013. 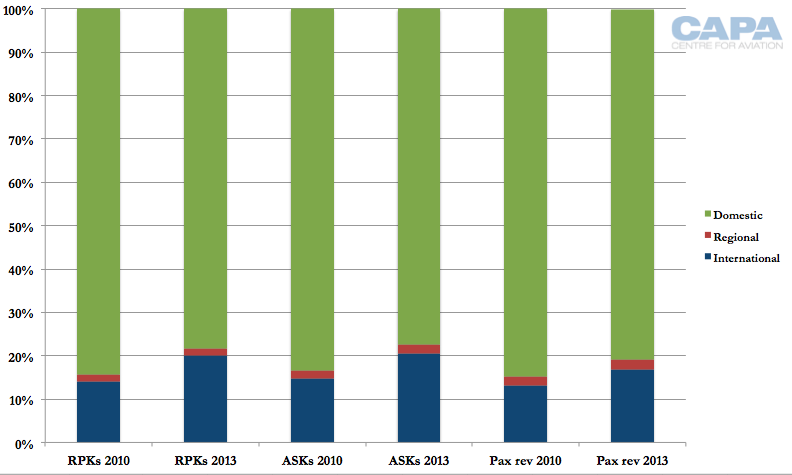 RPKs have broadly followed, increasing from 14.0% in 2010 to 20.0% in 2013.
International revenue grew from 13.1% in 2010 to 16.8% in 2013. International revenue can grow slower given the more efficient nature of long-haul operations allowing for lower-priced capacity. 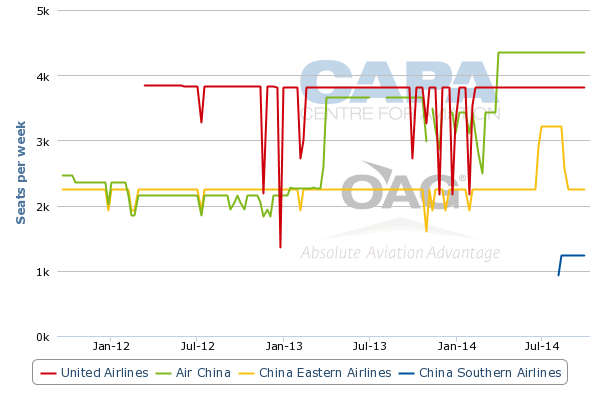 However, China Southern has also shown yield weakness as it expanded rapidly. International yields fell 3.4% year-on-year in 2011 and fell 5.4% in 2012. International yields fell 5.7% in 2013 but this is partially (but not entirely) offset by changes in accounting. China Southern expects to culminate its international long-haul expansion with a three times weekly Guangzhou-Changsha-Frankfurt A330 service, its first passenger flight to Germany, which is China’s largest trading partner. Air China and China Eastern already serve Germany with multiple flights although Air China and Star partner Lufthansa dominate the market. Air China is adding a Shanghai-Munich service in Jun-2014. China Southern’s circuitous routing is indicative of local subsides at Changsha. China Southern’s last planned long-haul route, Guangzhou-New York JFK, may also prove to be its long-haul pièce de résistance. While initially operating four times weekly, this will surely grow. North America, and the United States in particular, has become the key long-haul market for Chinese carriers, sustained by business traffic (which is recovering) and strong leisure demand supported by greater visa processing from the US. Chinese carriers are also not yet limited on traffic rights in the US whereas in Canada they face restrictions. China Southern’s only US route is a daily Guangzhou-Los Angeles service, which was up-gauged from 777-200 to A380 in 2012. While the load factor has been strong, the route has not been a financial standout. New York should be a different story as China Southern uses its new 777-300ERs (of which it has ordered 10), which provide a better amount and balance of passenger and cargo space. However, China Southern is entering competitive territory. Air China increased New York capacity in 2013 while China Eastern is increasing capacity in 2014 and Hainan Airlines launches a new route in 2014. Cathay Pacific has also launched a fifth daily New York area route with a Hong Kong-Newark service. There is also greater competition across the eastern US with Air China opening a Beijing-Washington Dulles service and Hainan a Beijing-Boston service. 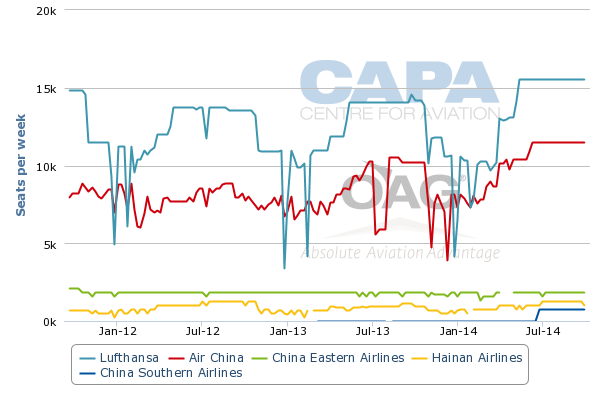 While China Southern does see long-haul growth slowing, it seems inevitable there will be more. This may occur in conjunction with the carrier’s next five-year plan, to be announced shortly. 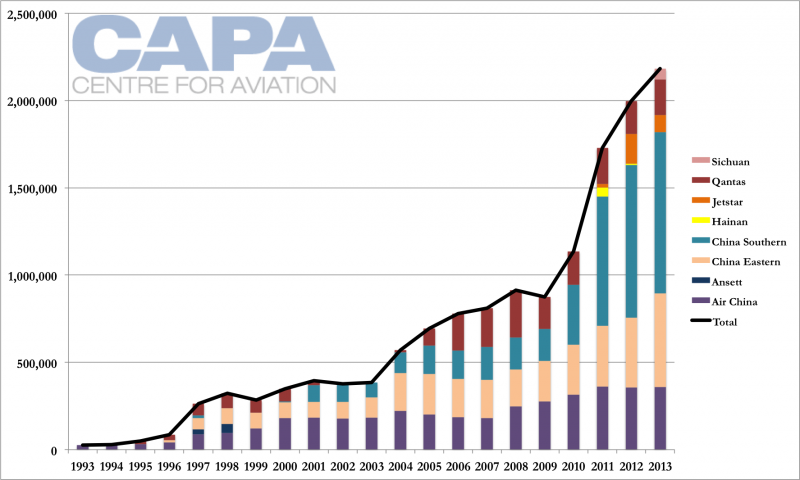 Long-haul growth seems dictated by arriving long-haul aircraft. China Southern has taken delivery of all five A380s it has ordered, one of 10 777-300ERs on order directly from the manufacturer, and eight of 10 787s also on direct order. China Southern also has 28 A330s in service and 12 on order, but these can be more difficult to track considering they are deployed domestically, regionally and on long-haul. Firm orders include those placed directly by the operator and by lessors assigned to the operator, from 14-Apr-2014 onwards. There are up-gauge and replacement opportunities, but this will not fully utilise the long-haul fleet. China Southern is understood to have considered additional long-haul points for its 787s, but these have not materialised. 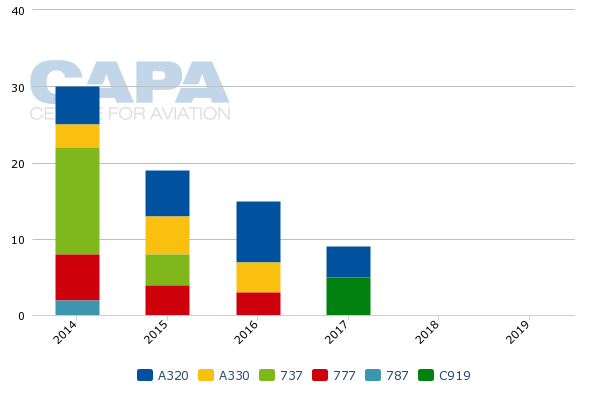 Long-haul services with its A380s have not been realised, with the five A380s used only for a daily Los Angeles services and limited domestic routes that have weak performance: economy class is full but China Southern’s large premium cabins are not, and the short sectors clock up cycles. China Southern had operated a Guangzhou-Sydney service, done more so out of lack of opportunities than sustainability, and this northern winter (Australian summer) service was conveniently dropped following China Southern’s partnership with Qantas. This has left the fleet with a low utilisation rate. The A380 has effectively become a white elephant, and the 777-300ER would likely give China Southern a better result on the Guangzhou-Los Angeles route than the A380. China Southern’s international drive has been felt in no place stronger than Australia and New Zealand, where China Southern early in the decade stated its intention to operate 55 return service a week. This early announcement allowed plenty of lead time for competitors to increase capacity. During the peak Jan-2014 and Feb-2014 season (excluding Chinese New Year, which always sees short spikes), China Southern operated 48 weekly services to Australia and New Zealand, leaving it with seven weekly services – a singly daily flight – to be implemented by 2015 if it is to meet its goal, although off-peak capacity will also have to be maintained. While the Australian market is suffering from over-capacity around Asia, a bigger concern for China Southern is likely traffic rights. The Australian dollar’s decline is also a concern, but its Australian traffic is heavily China outbound, limiting its exposure to the Australian dollar. Nonetheless, and perhaps with a caveat, China Southern will very likely meet its objective for Australia and New Zealand in 2015 in terms of capacity; profits are still to follow. China Southern’s guiding strategy for Australia was to find a source market that meshed well with its hub. Air China’s Beijing hub is matched well with the North American market, as Beijing has not only strong local traffic but the geography to efficiently route traffic around the rest of Asia. China Southern is less fortunate in Guangzhou, which operates in the shadows of Beijing and Shanghai – to say the least of Hong Kong. Australia is the only sizeable long-haul source market, and China Southern’s entry in Australia came as yields suffered on Asian services and the Kangaroo route. China Southern has heavily marketed its international connections, and its role on the “Canton Route” between Australia/New Zealand (Auckland, Brisbane, Melbourne, Perth and Sydney) and Europe (Amsterdam, London and Paris as online destinations, with far more available via codeshare on Air France and KLM.) But its traffic is heavily focused on mainland China; the Canton Route is supplementary, not critical. China Southern says in the peak season 70% of its long-haul traffic is connecting, with 15% connecting from a long-haul flight to another international flight but 85% connecting from a long-haul flight to a domestic China flight. That means that about 10.5% of China Southern’s long-haul volume is sixth-freedom traffic, and predominantly in the Australia market. Australia is a popular destination for Chinese, particularly for the country’s perceived positive environment. While these figures may seem low, growth is large: China Southern’s Guangzhou hub saw a 20% growth in transfers in 2013. Chinese carriers have not been the most active in the partnership arena, balancing alliance relations (China Eastern with AF-KLM, Delta) with non-alliance relations (China Eastern-JAL, Air China-Cathay). China Southern has a JV with Air France covering the Paris-Guangzhou route and a more limited partnership with Delta. 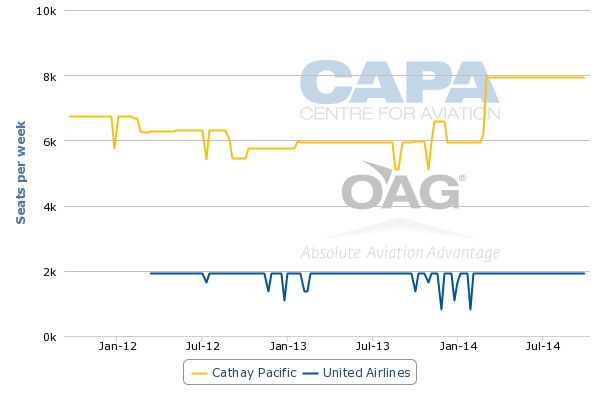 China Southern in Dec-2013 formed a partnership with Qantas, which not only helps China Southern’s position in Australia and New Zealand but also gives it an advantage over other Asian carriers, and in particular Cathay. Mr Si said China Southern would look to grow partnerships within alliances and beyond, and gave a firm undertaking: “No matter how big, it is very hard to survive long enough by working on your own. We have to look for cooperative opportunities.” It should be lost on no-one that this statement about partnerships comes not just from a large airline, but Asia’s largest. However, China Southern will naturally be careful to ensure it receives benefits. Potential partners may be wary of receiving as many benefits as they give, as well as the opportunity that over time they may lose relevance as China Southern can do more on its own. Mr Si singled out the US as a market where it needs partners, but cautioned developments may take two years. China Southern’s logical partner, Delta, is heavily experienced in partnerships having founded (via merger partner Northwest Airlines) aviation’s first joint venture. Delta will not allow itself to receive the short end of any stick. Where Air China has been blessed with a hub in the capital of Beijing, and China Eastern in the financial centre of Shanghai, China Southern has had to make do with Guangzhou, which not only has lower premium demand but has often been over-shadowed by Hong Kong and its large hub. So China Southern's international catch-up is a solid effort. But now the strategy must bed down, which the carrier is finally ready to be candid about. While there is weakness and losses, China Southern said all of its international markets improved in 2013. The financial focus is short-haul, where Korea has replaced Japan as its strongest market. But China Southern's main short-haul market, domestic, has its own intricate outlook, too complex to be enumerated here, but with a stronger outlook than international. For many passengers, it is China Southern's soft service that they will judge, and here there is much room for improvement, which China Southern has been open about for longer than financial performance. The two go hand in hand, and no doubt in Mr Si's long-term future, the carrier will get there. It is the short and medium term that is challenging. But that should not be used by competitors as an excuse to ignore the looming scenario of a much larger role in aviation for Chinese airlines.